Last weekend I was in my hometown for a short visit. 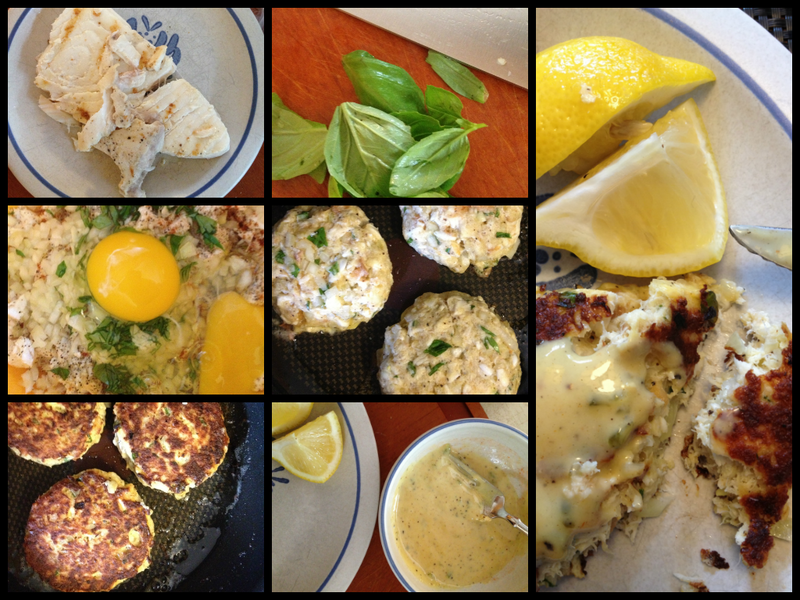 My parents, who regularly read this blog, made a delicious dinner on Friday night including insanely fresh halibut, roasted on the BBQ in tinfoil, and delicious homemade bread from the bakery. After having read my Rock the Leftovers: Taco Edition post, the big joke was how I’d take remaining food from this meal (if there was any) and turn it into something. Well, the next day, I was craving brunch. 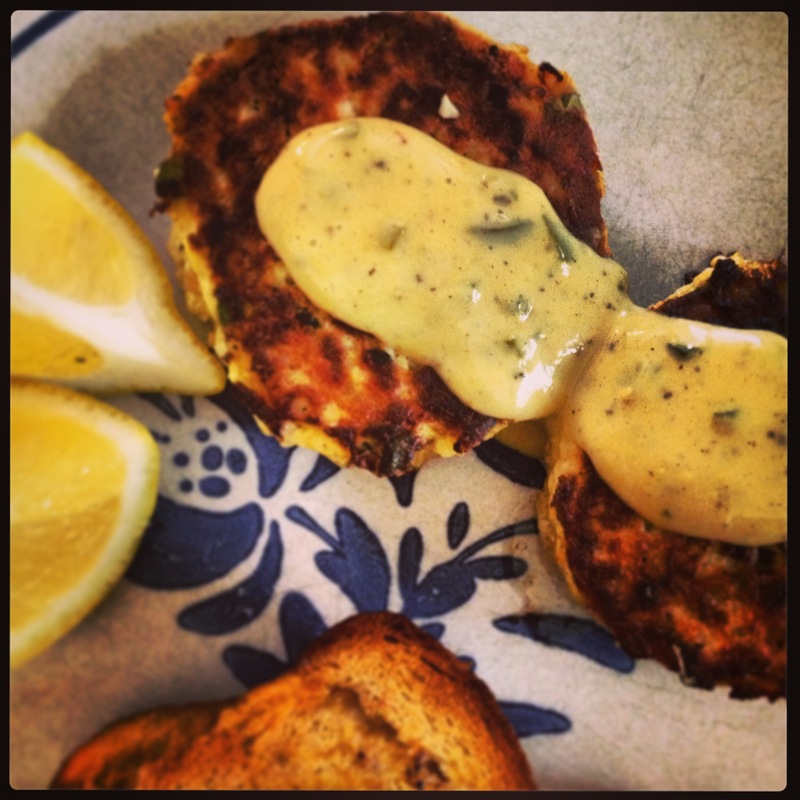 So I ventured into the world of fishcakes, using the strange array of products in my mother’s fridge, and came up with a very satisfying meal: lemon-basil halibut fish cakes with makeshift Dijon tartar sauce, served with homemade brown bread toast. Today I lucked out. Poking around the fridge, I noticed we only had odds and ends, none of which seemed to make any sense to me, flavour wise, to put together. After about five minutes of Googling, I found inspiration from a few different sources, and was feeling confident. 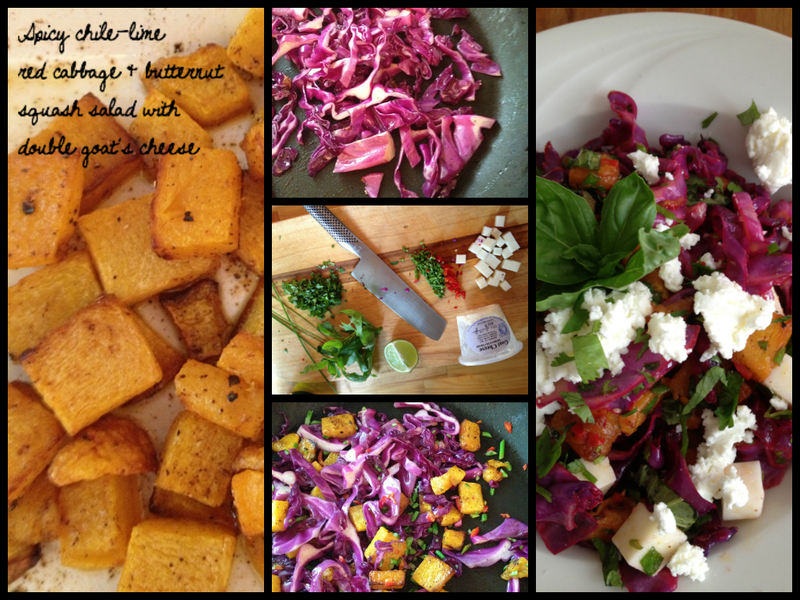 What I came up with is possibly the longest salad description out there, but here goes: spicy chile-lime red cabbage and roasted butternut squash salad with garlic scapes, cilantro, basil, and double goat’s cheese. Served warm. So good. What I did was roast the butternut squash in small chunks (tossed in olive oil), seasoned with salt, pepper and a little chili powder. That took about 20 minutes. Using the leftover oil from roasting the squash, I then sauteed the sliced red cabbage quickly with hot red chiles and garlic scapes. Next, I threw them together in a bowl and let them cool off a bit. Then I tossed the ingredients in freshly squeezed lime juice, salt and pepper, fresh cilantro, basil and chives – plus chunks of firm Ran-Cher Acres goat gouda. To top it off, I crumbled Ran-Cher Acres regular goat cheese. SO delicious. Glad I went out of my way to make those odds and ends work. 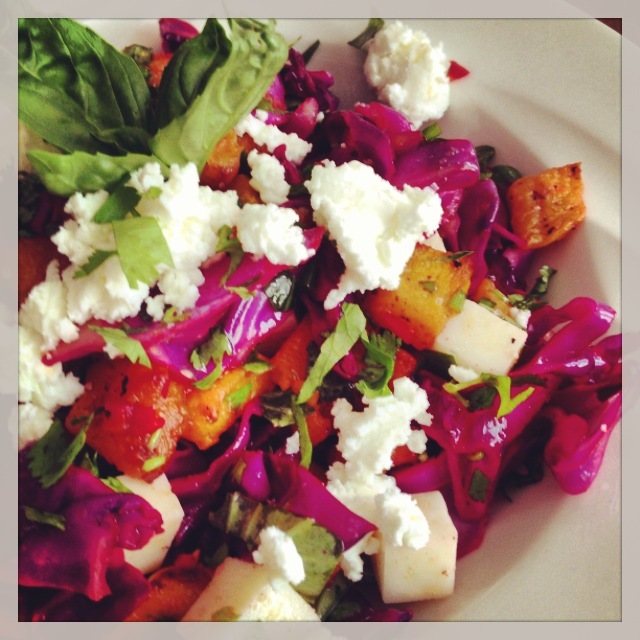 Spicy chiles, creamy squash and goat’s cheese plus crunchy cabbage made this salad balanced and tasty!